University of Chicago Press, 9780226289236, 494pp. In the illustrious and richly documented history of American jazz, no figure has been more controversial than the jazz critic. Jazz critics can be revered or reviled—often both—but they should not be ignored. And while the tradition of jazz has been covered from seemingly every angle, nobody has ever turned the pen back on itself to chronicle the many writers who have helped define how we listen to and how we understand jazz. That is, of course, until now. In Blowin’ Hot and Cool, John Gennari provides a definitive history of jazz criticism from the 1920s to the present. The music itself is prominent in his account, as are the musicians—from Louis Armstrong and Duke Ellington to Charlie Parker, John Coltrane, Roscoe Mitchell, and beyond. But the work takes its shape from fascinating stories of the tradition’s key critics—Leonard Feather, Martin Williams, Whitney Balliett, Dan Morgenstern, Gary Giddins, and Stanley Crouch, among many others. Gennari is the first to show the many ways these critics have mediated the relationship between the musicians and the audience—not merely as writers, but in many cases as producers, broadcasters, concert organizers, and public intellectuals as well. For Gennari, the jazz tradition is not so much a collection of recordings and performances as it is a rancorous debate—the dissonant noise clamoring in response to the sounds of jazz. Against the backdrop of racial strife, class and gender issues, war, and protest that has defined the past seventy-five years in America, Blowin’ Hot and Cool brings to the fore jazz’s most vital critics and the role they have played not only in defining the history of jazz but also in shaping jazz’s significance in American culture and life. John Gennari is associate professor of English and critical race and ethnic studies at the University of Vermont. He lives in South Burlington, Vermont, with his wife and their twin daughters. "[Gennari] does perform something magical: he manages to make the role and history of the jazz critic interesting. This finely written, thought-provoking chronicle of the most prominent jazz writers of the past century begins with pioneers John Hammond and Leonard Feather (who helped the likes of Duke Ellington get much needed attention) and ends with modern-day jazz critics like Stanly Crouch and Gary Giddens. Gennari connects the critic to the musicians, showing the roles they played in disseminating information and connecting the acts to the audience. This is an essential purchase for any comprehensive jazz collection. Highly recommended." "This is a book about jazz in which the music is in the background, for John Gennari’s main concern is a critique of jazz criticism from the 1930s to the present. Densely researched, broadly unpartisan and compiled with a wry sense of humour, Blowin’ Hot and Cold still manages to reveal much about jazz, and more about the lives of its musicians, than any number of hagiographies." 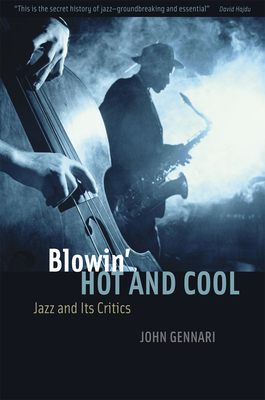 "Gennari's Blowin' Hot and Cool: Jazz and Its Critics is an original and fair-minded account of how American writers have constructed cultural meanings for jazz. Gennari, an English professor who writes vivid prose, shows how canon formation and the proposition of jazz as high art did not start with Jazz at the Lincoln center but is continuation of a project begun by writers in the 1930s. . . . This is a timely and important study." "One of the last great untold stories in jazz has been addressed." "This is a well-written overview of many different perspectives of a rich and engaging music. . . . This book is not just rich in information and storytelling, but also in the ebb and flow of the passions that underpin jazz. In the process, Gennari finds decades of discourse and disagreement, alliances and arguments. . . . Contrasting and blending together the perspectives of many different critics over three quarters of a century, this book is a truly fresh look at the history of jazz." "Thoughtfully questioning one's taste in jazz is like cleansing your palate between the courses of a rich meal. Only the very best writing can provoke such fundamental questioning. Count Gennari among the very best jazz writers. . . . If you're ready to open your mind, this book is for you." "Reading [Blowin' Hot and Cool] is a liberating experience, one that brings the music closer. . . . This is a rich book, bursting with anecdote and observation." "This is a valuable book, and a fascinating one, ranging from the important role played by the critic, John Hammond . . . in the 1930s, to the epic battles over the 'Young Lions' movement in the 1980s." "The story that Gennari has to tell is compelling, his research is deep, and his argument is sound. My vision of jazz is distinctly richer for having read this book." "Gennari's prose conveys a sense of immediate importance and makes for a surprising rich narrative structure. . . . [The author's] ability to merge the biographical, historical, intellectual, formal, geographic, and ideological trajectories that informed the combination of music, critical discourse, and audience appreciation makes it clear that the writing about jazz is an essential part of our understanding of the superstructure of American modernity." "Gennari delivers a book that, in chronicling nearly a century of debates within jazz, links those debates to wider discourses in society. . . . This is a strong opening statement on a subject ripe for fresh analysis, confidently argued, with which anyone interested in jazz, its history, and its fluctuating but significant place in American culture will want to engage."